We couldn't grill yesterday as thunderstorms prevented us from doing anything outside. Today, on the other had, the skies cleared and the temperature rose. As we approach summer, and the days where it's too hot to do much in the kitchen, outdoor cooking becomes more and more inviting. Besides, it's easier to just leave whatever food you drop on the ground and walk away. Sadly this is a practice I tend to employ within our home as well but it's a little more shameful when done in our own kitchen. It does attract fewer racoons though. My goal was to grill some nectarines for a salad. Unfortunately after two failed attempts at separating them from their pits and creating quite a mess I opted to just slice them up and serve them over the red sail lettuce and suehlihung mustard greens. At least I think they were the mustard greens. 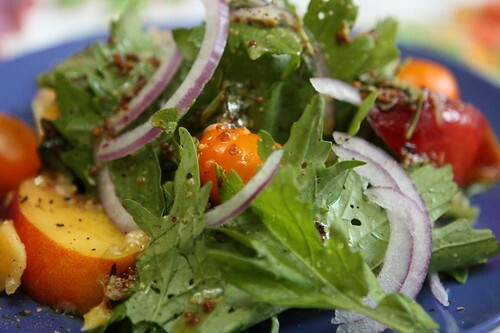 Truth be told they are indistinguishable in shape, taste, and flavor from the mizuna. This furthers my theory that they were just improperly labeled at the pickup site. I added some sliced red onion, Zima tomatoes, and some leftover tarragon and mustard vinaigrette as a dressing. 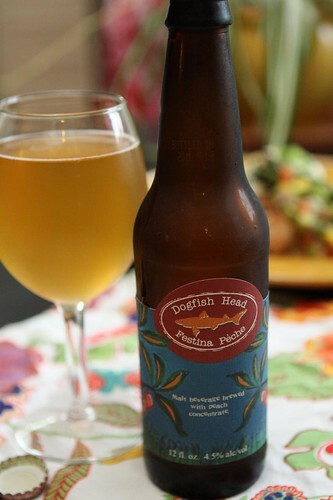 For beer I was recommended this Festina Pêche from Dogfish Head. I poured it into a wine glass because that is the recommended serving vessel and, apparently, I am a jerk. I am always leery of fruit-based beers but this beer was pretty tasty. It wasn't sweet at all. In fact it was very tart. It reminded me of a very nice cider or perry in that respect. It tasted a little more like a tart white wine than a beer. It's not an every day beer but it went nicely with my fruity salad. Besides, what better way to torment my father-in-law before Father's Day? For a main course I had some beautiful opah that I drizzled with lime juice, olive oil, salt, pepper, and a light sprinkling of Paul Prudhomme's Meat Magic. 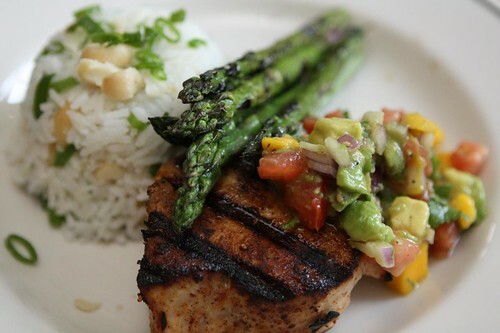 I grilled it lightly and served it with white rice tossed with crushed macadamia nuts and green onion. I also made a relish (or salsa?) made with red onion, garlic scapes, tomato, mango, avocado, salt, pepper, and cayenne. We had what is probably the last decent bunch of asparagus of the season in the fridge. It was from Canada, the last available spot in North America for seasonal asparagus as spring chases the vegetable north for the year. This was not the ideal match for this meal but it was leftover from last week's sister-in-law vegan extravaganza so I needed to use it soon. Besides, I like grilled asparagus. Since the another Festina Pêche had approximately the same alcohol content as O'Doul's I opted for an after dinner drink. Since I started with Dogfish Head I figured I'd finally get around to polishing off the Midas Touch Golden Elixir that has been in the fridge for a long, long time. Flavored beers are not my go to sort of beer but with all the fruity flavors of the meal why not cap it off with a beer flavored with muscat grapes? Like the Festina Pêche the Midas Touch is not sweet at all but full of bizarre and interesting flavor like most Dogfish Head beers. And what better way to close out a Saturday night than by watching Airplaine! with Jen. Over our viewing of Top Secret last night (or should I be annoying and call it a screening?) it came up that she'd never seen the classic Abrahams and Zucker film. It was clear after that revelation that something needed to be done to remedy that. Was I miffed that she hadn't seen this film? Yes, and don't call me surly.